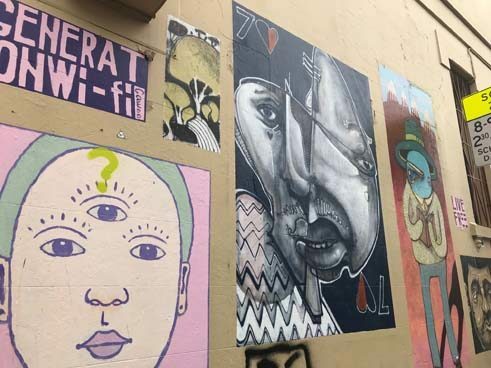 Unlike Melbourne, Sydney is not necessarily a city best known for street art, and yet, Sydney's Inner West has a lot of street art to offer. 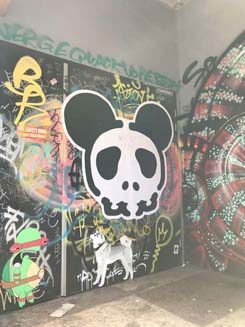 Even street art tours are becoming increasingly popular, as do the tour providers. 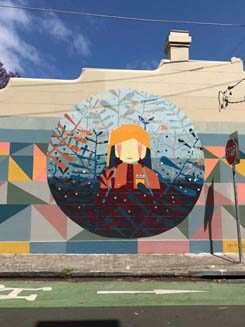 To find out more about street art in Sydney, I’ve joined a tour by Culture Scouts. 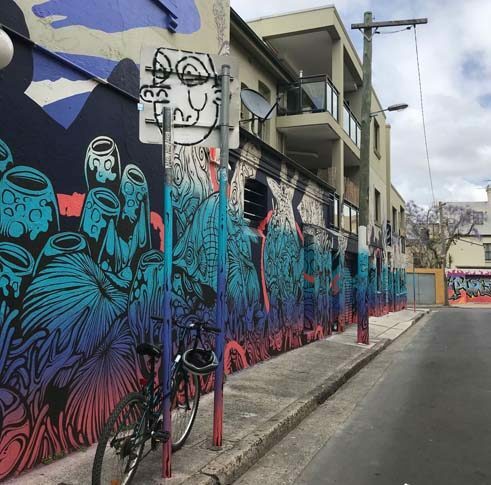 Led by Melinda Vassallo, the tour focuses on two suburbs, Enmore and Newtown. 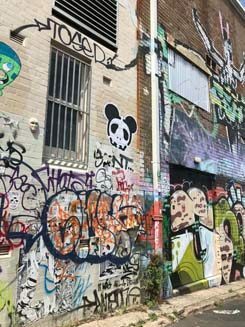 Melinda is a graphic designer, author of the book “Street Art of Sydney's Inner West” and a true connoisseur of the scene. 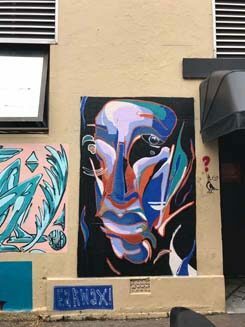 She stays in touch with various street-art artists and knows exactly where to find Sydney's best street art works. Rays of sunshine fall on the concrete - it's warm. The smell of coffee wafts through the streets and friends meet for lunch. The neighbourhood is full of life, the atmosphere relaxed. Bright colours adorn the facades of houses, garage doors and walls. 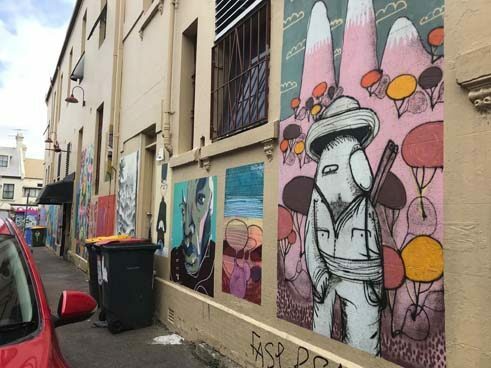 The tour starts in Newtown, the birthplace of Sydney's early street art scene. The most famous and oldest street art painting is by Andrew Aiken and Juilee Pryor: I Have a Dream! (1991). 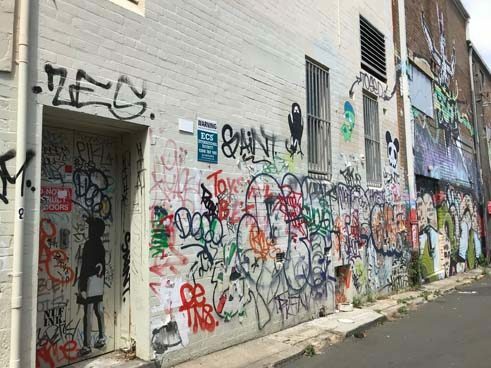 They are part of a group of artists called Unmitigated Audacity Productions, who has created a variety of street art, which was still illegal back then. 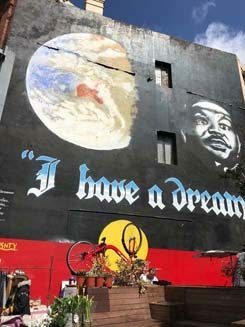 „I have a dream!“ is Newtown’s most famous mural by Andrew Aiken and Juilee Pryor. | © Ramona Bialowons The mural on King Street captivates viewers with a quote from Martin Luther King. Melinda: "It is now one of Newtown’s most well-known landmarks and symbolises the rights of Aboriginal People." The residents of Newtown are proud of the work and really treasure it. Melinda tells us that there was a fire in the building and the work got damaged, but the community came together and restored the mural within a few days. 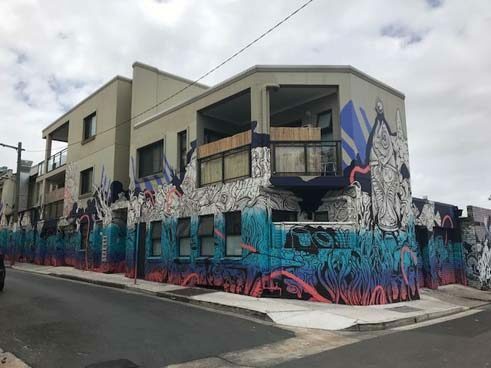 In Newtown, street art can be found in a number of places: On walls, in backyards and small streets, as well as in underground car parks. Melinda leads us right through the neighbourhood, and shows us all the hidden alleyways. It pays to venture a bit further away from King Street to find the more hidden murals. 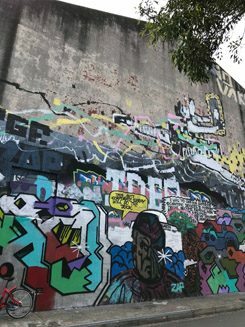 The various styles of street art leave artists plenty of room to express their creativity, like they have done with the Newtown Poetry Wall. 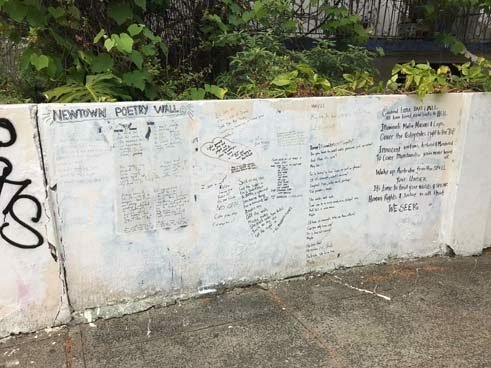 A poetry wall in Newtown where people can write down their poems and messages they’d like to share. Street artist Birdhat is famous for his bird heads. Mary’s is one of Sydney’s best burger restaurants and also covered in tags. 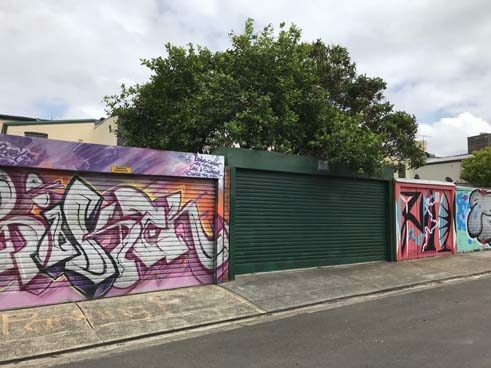 A garage in Newtown full of street art. A mural by Jumboist aka JUMBO. A wall in Newtown covered in tags. The black background makes the colorful street art pop. Oftentimes street-art is used to express political views. 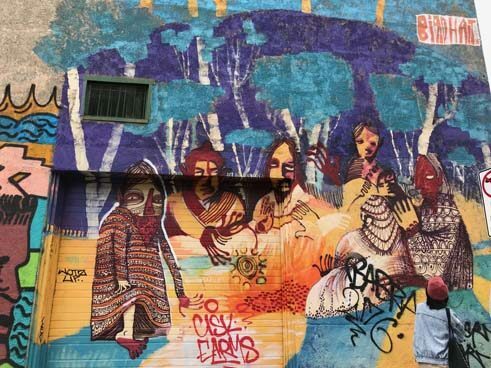 This street art mural by Ox King is also part of the Perfect Match program run by Inner West Council. But street art doesn’t necessarily equal street art. There are quite a few different styles. But to take a closer look, we have to go back to the roots: graffiti. Graffiti is sprayed with a can. 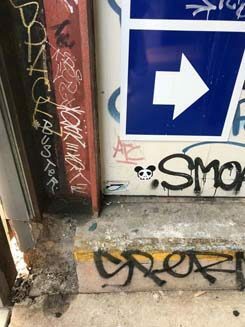 Through very large letters, also called tags, graffiti artists mark their territory - be it on house walls, garage doors or any kind of surfaces. They either represent a logo of an artist or serve as a signature under a mural. Some artists sign their work to be recognised, as well as being appreciated for their art, such as Alex Lehours. However, not every work reveals who created it, as some artists prefer to stay anonymous and therefore leave their art without a signature. This is a large-scale mural by Alex Lehours. | © Ramona Bialowons Tagging is the most basic type of graffiti. "Almost every street artist started with this method," Melinda tells us during the tour. However, most people don’t really like tags. They’re often sprayed illegally on walls and have to be removed afterwards, which can be costly. But unlike graffiti, street art is now accepted by most people. Whilst there are clear differences in the various styles, using a spray can is still the most common form. Other styles include stencil art, paste-ups (stickers), tiles, sculpted figures or knitted wool patterns at traffic lights and lampposts. Many artists express their opinions with their paintings, pass on a message or communicate something. This may also include socio-critical issues, such as this artwork by Phibs, who wants to draw attention to the topic of marine pollution. With this mural, Phips intends to draw attention to the pollution of our oceans. Melinda: "Street art is very popular in Newtown. 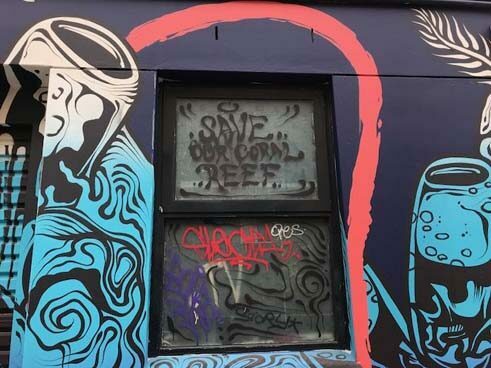 Therefore, street art has become something commercial, which is often criticised by graffiti artists.” Building owners and the local council often pay artists for murals to avoid mere tagging, as removing tags can actually be more expensive than paying an artist for a mural. 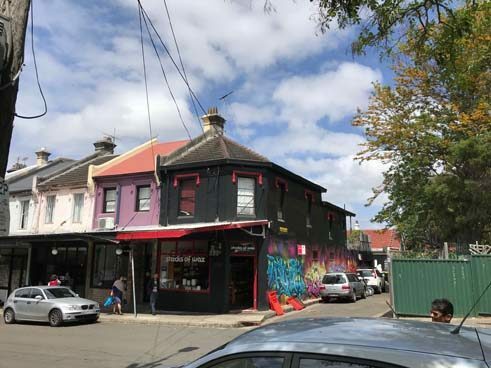 Artists and residents in Sydney's Inner West take a respectful approach to co-habitation. However, due to a number of prohibitive signs, there are still a few walls every now and then that remain blank. No street art allowed declares the sign above this black gate. | © Ramona Bialowons For the most part, the relationship between artists is quite respectful, "however, some ‘gangsters’ spray their tags over other artists’ murals or in forbidden places, such as train stations, which can lead to their arrest. 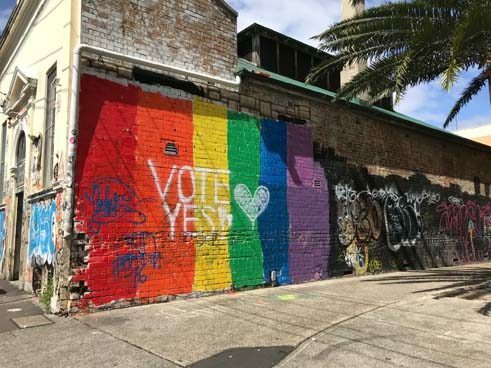 “But these ‘gangsters’ are an exception in Sydney’s street art scene. During our tour, we meet artists who are currently working on a mural. The atmosphere is relaxed, and the artwork is created swiftly. Out of respect to the artists, I don’t take their photo while they are working and leave it to them to decide if they want to be recognised or if they prefer to remain anonymous. These atypical street art murals appear like they are on display in a gallery. 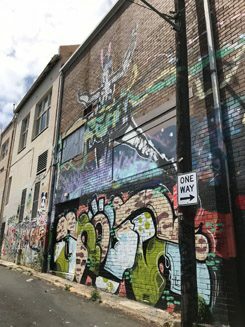 This street art wall looking like a gallery can be found on Goddard Street in Newtown. The left picture is by Gwaa and the faces by Ears. Ears is known for his fragmented and fractured faces. The same paste-up in three different places. 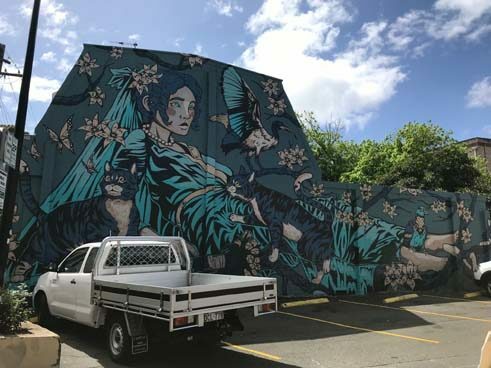 This mural was painted by Kyle Hughes – it is part of the Perfect Match program run by Inner West Council. 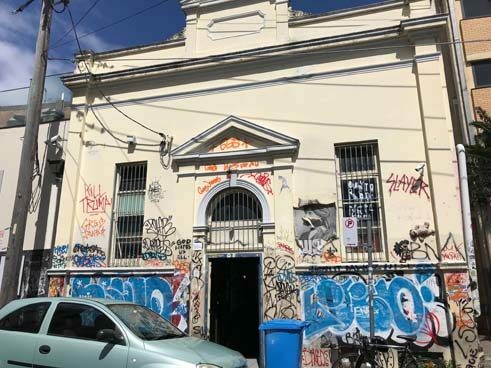 Perfect Match is one of the council's initiatives to prevent unwanted graffiti through fostering legitimate creative expression and art in public spaces. Street art is an art form, a culture that surprises and excites passers-by. The scene continues to evolve and new mural paintings quickly emerge everywhere, ready to be discovered. 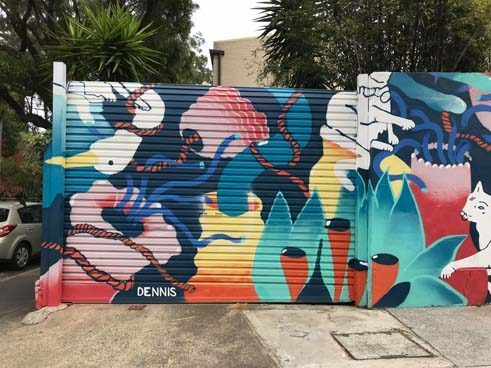 - A visual tour of Sydney's colourful Inner West. Ramona Bialowons was an intern at the internet department of the Goethe-Institut Australien. 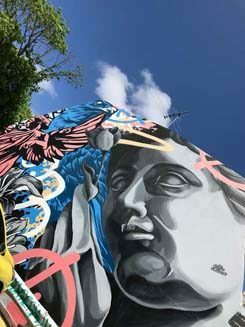 For this article she joined a street art tour by Culture Scouts.